It is rare that we find aspects of our life that evoke so much passion for us on a daily basis. I recently read a series of articles written by blogger T.R. Knight and his wife, Angie. These articles were so moving and evoking of what I aim to shed light on in the gaming universe that I couldn’t hesitate to share them with you all. I hope you read through these articles and you share in the same joy, respect, and admiration that I have for this couple’s commitment to each other in gaming and in life. T.R. Knight is a fellow blogger and gamer whose personal journey in gaming brought me to tears the first time I read his article. He and his wife, Angie, are living a gamer’s life and making it work even through the struggles of MS. Angie was diagnosed with Multiple Sclerosis in July 1997, and yet, that hasn’t slowed down this couple’s love and drive for gaming. It is their passionate and loving story that I am so attached to. Tabletop gaming has become an outlet for them, as it helps fit within Angie’s current MS symptoms. I will admit, as a writer and gamer, I never thought that tabletop gaming could be used in this fashion. A therapeutic, social interaction that allows for those with agility/mobility and memory issues to still be active within the gaming community. T.R. and Angie are sharing with me a whole new outlook on how to run games, what aspects to focus on, and what styles of gaming are most accommodating to patients with MS. I am blessed and honored to be sharing their story with you now. T.R. has taken it upon himself to give a valuable resource of MS symptoms and how they have impacted Angie and their gaming life in his most recent blog. Angie has also taken to his blog and posted her personal perspective on what games appeal to her. I’m going to definitely take these aspects into account as I go forward and progress as a game designer. I hope, T.R. and Angie, that one of these days I’ll have helped a company build a game, or design my own, that both of you will be able to enjoy. Please feel free to read through all their articles, as they are a joy to read and offer amazing insights into a side of the gaming universe I think many of us rarely see, or forget exists. T.R., you are truly a knight among men sir. I am honored to be among your supporting guild, and will continue to share the knowledge you and Angie have to give the world. God bless you both on your path as family, loving companions, and exceptional gamers! Accessibility for All. Happy gaming to you and your family! So why is this important, well, for years I have heard the nay-sayers and the hoards of pitch-fork laced, torch bearing parental units who march up with every cause in the book about how games will inevitably kill off every feasible skill that their child has. They feel like the idea of video games as an educational medium can’t possibly be a reality, and that today’s console market is so laden with violent, mature, sexually explicit content that even an unladen swallow would be burdened down by the size of that irrational coconut. The fact of the matter is parents are only seeing a fraction of the market, and they’re also only seeing the visual content in which a game provides. Now, first and foremost, I want to make it known that I don’t condone violent video games for children. It’s wrong and it’s a parent’s decision to make sure that a child’s influences are maintained and controlled. The truth is that the video game market isn’t as scary as parents make it out to be, and in fact, games offer children so much more to this generation than they had when I was growing up as a child. 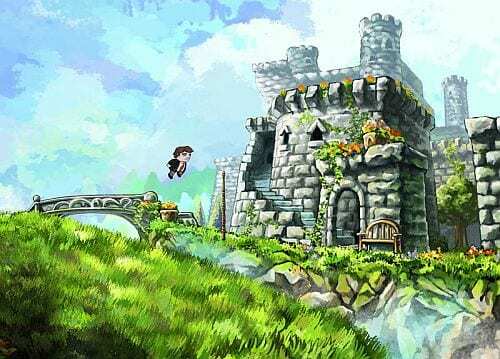 The reason I chose to write about this today is because I listened to a discussion by a game designer, Gabe Zichermann, and his theories on why children seem as though they may have attention deficit disorder and why games are actually quite educational for well, not just children, but everyone. Museum Madness – History, Science, Physics, etc. Now why is all of this important, does it even really matter how I grew up and what games I played? Well, no, but each of these games has affected how the gaming industry has developed itself in some way. The Sims proved that our limitations of our brains were only limited by the world’s we could create. Will Wright proved to the world that games were not just infantile toys, but methods of expression and creativity for our brains. Zichermann expresses this very well in his talk, basically explaining that perhaps the reason children these days seem like may have ADD, is because with technology and games at their fingertips children of this era have become immune to traditional teaching methods, because our world is too slow. Most modern games today don’t come out of the box and state that they’re educational material, except if you count companies like Leapfrog, MobiGo, and V-Tech that specialize in kid’s educational game development. Modern consoles, however, not so much. Sure there are a few games here and there that specialize and overtly state that they are an educational game for kids and parents [ Once Upon A Monster comes to mind… ] but for the most part the console market is weighed down by heftier, meatier, more robust content. Does that mean that they’re not educational? Absolutely not! 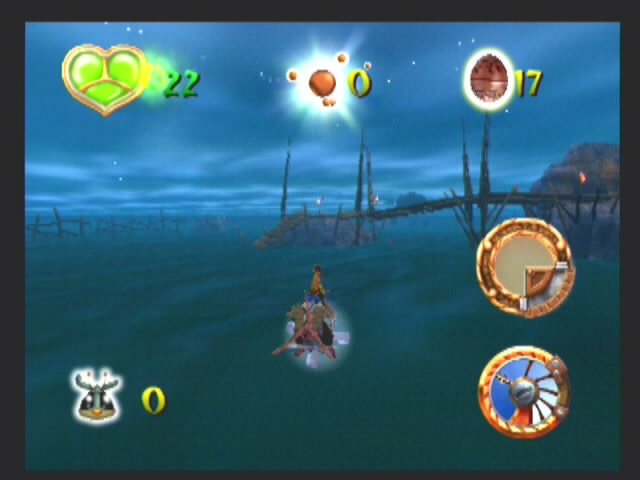 Notice how many items that a player has to keep track of: fireflies collected, health bar, precursor orbs, jet ski speed, map, etc. These are all visual cues that a player has to be cognizant of at one time or another throughout the entire game. Zichermann explains that this sense of immersion and cognitive experience is actually better for students and he even gives an example in the video about how a teacher, Ananth Pai, replaced his students school curriculum with game-based education. He gave students Nintendo DS systems and off-the-shelf video games that helped promote math and language skills. The results were astonishing as the students within the class jumped an almost full grade level in their educational awareness. So to say that games are non-educational wastes of space is just wrong and unsettling. Zichermann states that gamification and the result of the overwhelming acceptance of video games in our lives gives us training methods at our fingertips. He expresses that games are growing up everywhere from our cars, to our homes, to our stop lights. We’re developing into a game based culture and we shouldn’t be scared of it. I personally believe we should embrace it, because it will give us a way to make all of this social media, social interaction, immersive education, collaboration efforts, etc. If you haven’t read my article on Jane McGonigal’s ideas on how gaming can make a better world, Zichermann’s ideas embrace McGonigal’s ideas and he understands that the world is changing to a game-based society. The use of games will help us make the world fun, educational, collaborative, and will actually allow the children of our world provide a way to make a difference in our current society. If, after ALL of this, and you still don’t believe in my endorsement of gamification and it’s affects on the educational processes of our culture, I urge you to check out two things. First please check out this video of a young 12 year old boy named Thomas Suarez. This kid is amazing, and I’m hoping one day when I get lucky enough to have children of my own that I’ll eventually have a son like this kid. I hope that my love of video games and technology will rub off somehow and my son or daughter will embrace the technological era and run with it like Thomas has. He’s not only taught himself coding and how to design apps for a global market, but he’s now teaching an app building club for fellow students in his school! Honestly, if that isn’t the coolest thing in the world I don’t know what is. More power to you Thomas! Keep it up man! Secondly, I’ll ask that if you’re STILL skeptical that this modern era of video games is going to ultimately bring down the educational levels of your children to a diabolical screeching halt have no fear. Unfortunately, no, our consoles and PC’s are not the TARDIS and I highly doubt any teacher is Dr. Who [ although that would be fantastic! ] but teachers need to get informed as to how our educational mediums are becoming too basic for students. We have to make education engaging and exciting, and the way to do that is to introduce gaming of some sort into the classroom. If you’re interested, and a teacher, I urge you to check out this string of articles by Andrew Proto – a fellow blogger over at Zichermann’s Gamification Blog. Take care folks, and may the educational system be enhanced by the methods that we choose to teach from in the coming future. I can’t wait for the day when games start to help problem solving real life issues, and we start to see a real change in our world due to awareness and activity formed by video game play. Alright, so in Super Crate Box, you play as a super amazing crate that must fend off enemy hoards that want to eat your tasty box contents. Each crate you acquire during the game will give you access to new guns and ammo that will help you mutilate the hoards of 8-bit enemies along the way. Now, I obviously have gotten my hands on the BETA version of the game. The newly refined iOS tablet/phone versions look like they control MUCH simpler than the BETA version. So, sadly, I have to discuss functionality of this version and compare it to the upgrade – so hold in there with me. Super Crate Box is visually stunning, in a sort of, “Oh look at how vintage I am!”, sort of way. It gave a visual feel akin to the many times I played through Donkey Kong and Super Mario Bros. 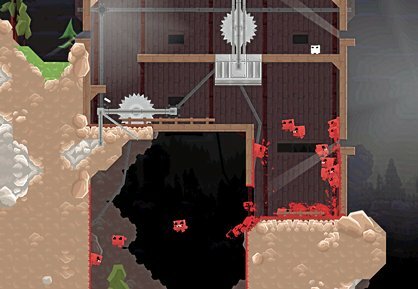 The platform shooter is amazing visual wise. The cute little crate wielding weapons of doom is pretty amusing and the aliens have just enough AI to make the game tense and appealing. Now, as far as the gameplay is concerned this is where it gets tedious and I’m sorry, but we’re going to have to rip bandaids off the wounds now. Super Crate Box is probably far MORE accessible via a tablet or phone device, but the Mac and PC versions require an incredible amount of dexterity and precision to accomplish. This is because the key settings are all across the keyboard. There are a limited number of controls: Z for jump, X for shoot, and the Arrow Keys for movement. To actually make my crate-boy jump took some difficult finger movements to accomplish. Perhaps that’s just me, but the controls felt clunky and spaced out too much to make an accessible match fully possible. I would love to try the game out on iOS, because I think the game is a wonderful vintage installment. If I could click the screen that would have helped too. If I could just touch a space on the play field and my crate-boy would jump to a platform and grab a box, etc. that would provide so much more fluid accessibility to the game. A couple of other things about the game that I found sort of difficult in my PC version: The options menu provides you a control scheme A or B, but it doesn’t tell you what the control scheme switch is – what buttons etc. This is frustrating, because I wish there was a “Mouse Only” control on here so that all actions could be initiated by a single touch. It would make the game behave smoother, perhaps that’s why they drafted the game for iOS, so that they could provide a smoother gameplay experience. Vlambeer is a wonderful new company and I wish them the best of success, and great eye noticing the accessibility concerns from your PC draft. I think the change to iOS medium will give the game a more “NES” style of gameplay that you can hold in your hand. I’m hoping that this game becomes a cult hit. It’s already been an underground sensation since 2010, but now with all the kinks out and a more accessible platform maybe they’ll get even more people playing this wonderful game. I brought this game to attention today, because I thought it was important for people to see how game companies can learn from initial launches of games and see where the accessibility lacks. This, in turn, can help them design and draft a more accessible version down the line. Colorblind gamers may have some issues with some of the backgrounds and platforms, but the enemies are all very varied vibrant colors and so that makes spotting them much easier. Motion-impaired gamers will have a severely hard time with the PC version as it requires use of both hands and precision to pull off all the moves, and deaf players can play this game no problem, as it really doesn’t require the use of sound to play. Overall, it’s nice to see a game company recognize that their game could fit an accessible mobile market, and I’m excited to see the future of this game. You can currently get Super Crate Box via iPhone, iPad, or in the iCade for .99 cents! This is an amazing deal and it’s got a lot of great gameplay value for a mere dollar! I’m unsure if they’ll be launching an Android version, but if I manage a convention this year I’ll try and see if I can’t ask if an Android version would be possible. This is a great example of how controls can make a game more difficult, but how developers can learn from that difficulty and turn it into a positive step forward in accessibility. I would also like to point out that games like this would also be wonderful on console formats! Wink Wink Vlambeer! Happy alien-hunting, you gun-weilding future-Craters! The Warbler’s Nest is an interactive-text adventure [ and for those of you who know what it is you’ll be fondly reminded of Zork.] and through the glory of the power of words, the game intends on taking you through this adventure and mystery as you type along with it. At first, it may seem like a boring game, why would someone want to sit and type directions into a computer right? Oh, but how you’d be wrong there. The joy that comes from Warbler’s Nest is that it’s a fairy tale adventure lined with mystery and charm. The whole transition of using your imagination to depict the events being given to you on the screen changes the value of every piece of information and players should become deeply invested in trying to discover the mystery of this place. > The familiar reed bank behind your cottage surrounds you, filling the damp space between your home and the river to the south. It may not seem like much, but as a player there is some sense of mysticism about what is now around us. We become intrigued by the fact that there is a river close to our home, so perhaps we check there, or perhaps we turn back towards our home and check the house. The decisions that come up here are all up to YOU as YOU investigate this area around you. The suspense comes later in the game, and so I won’t give any of the storyline away if you care to play it. The fact is, this game does something that I don’t think a lot of current games allow you to do: imagine. As children we grow up constantly playing, imagining, and creating our own worlds, our pretend lives, and even, often times, imaginary friends. Our realms of make-believe and mysticism are vast and well used, because as we imagine and grow we learn from our creativity. Games in the mainstream market hinder this creative spark in our brains. They take the enjoyment of visualizing an environment for ourselves out of the picture and clutter the scene with their own visual interpretations, forcing us to participate in a storyline the way they have depicted it. McIntosh gives the world something that it needs right now: childhood whimsy, mystery, and imagination. He forces us to revert to our youth and examine a situation based on intuition and problem solving by using our own interpretations, rather than holding our hand through a linear progressive storyline. I feel that so many games can take away from this model that I felt I had to share it with the masses. If you think about it logically this game does nothing more than the pen-and-paper matches of DnD, except that now McIntosh has basically programmed the Dungeon Master to respond to your inputs. 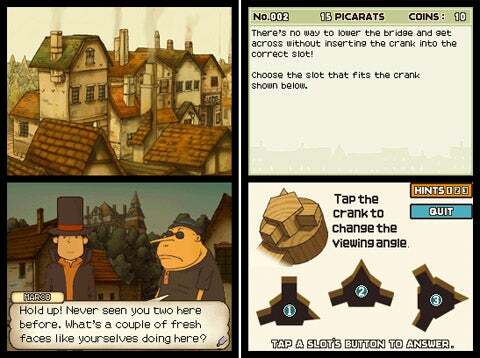 This type of “I can solve this on my own!” intrigue and mystery is important to games, and I definitely see it being lost to a world full of handholding tutorials and linear games that guide you every step of the way. Allow us, as gamers, to explore, to create, to imagine and grow with the game. Gaming should be an immersive experience, not like a movie I just sit through and lack any interaction with. There are some flaws to The Warbler’s Nest, and I can tell you from a design aspect, some moments of the game will annoy you. The boundaries of the game are clearly defined, but you’ll find yourself often doing quite a lot of backtracking to find out what paths you can take, gather items, etc. This shouldn’t annoy players who don’t mind adventure games and actually have a passion for the backtracking collective type. The issue I found is that you can get lost, and often times when you want to go somewhere, you can’t because the game’s programming states that you have to finish a task first before moving on. The game, overall though, is quite a grand statement to the world that games don’t require visuals to be fun. I spent hours trying to solve the puzzles, investigate the mysteries of my river cottage, and I loved how invested I became. The joy I get from this game is that it’s accessible to everyone. It’s not a timed game, so you can take as long as you need to type your responses. The interface is easy to understand and it even has a helpful .pdf file available for access if you haven’t played interactive-text games before. The game is truly accommodating to the user, and for that, I’m thankful. There were some things, like an inventory layout, or a map pop-up, that I may have liked to see integrated, but the game stands alone on it’s own just fine without anything to hold your hand with. I definitely think any designer looking to see how games can be made simplistically, and with the same mysterious intrigue as some modern games – they should definitely check out this game at least once. 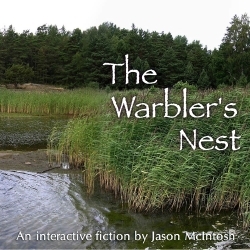 If you’re interested and would like to give your imagination a massage for a change, check out The Warbler’s Nest here. See if you can solve the mystery and let me know how you did. The game is rather short, but it’s an enjoyable slice of vintage-style gaming that I think everyone needs to witness. We all need to clean ourselves off in the pool of imagination once in a while don’t you think? Hey there folks, so tonight, I can’t sleep. I’m driven mad by the desire to do artwork, create, imagine, sort out my ideas and my passions. I’m enthralled by the allure of what may very well, one day, be on video screens and consoles everywhere – but first I have to gather my pants together logically and realize something drastic. The video game industry that I see on television and news, and perpetuated in magazines is probably not going to be the same reality I’m going to have to face. It’s probably not going to be a walk in the park, and I’m probably going to get my face stomped on more than a couple of times by idea bashers and nay-sayers. I’ve grasped this concept. Do I still want to move forward and be a game designer? You bet your sweet Princess Peach backside I do! Now this week I’m discussing a movie, that quite honestly, I’m ecstatic that something like this is finally being made! Those of you in the gaming world have probably heard of movies like King of Kong: A Fistful of Quarters or Chasing Ghosts: Beyond The Arcade. Both of these movies are excellent documentaries of the old school video game arcade market, but now, the gaming industry has switched it’s attention to the indie circuit. The newest documentary to loom it’s lustrous digital locks in the face of the world, is a movie called Indie Game: The Movie. The movie chronicles the game development process and interviews some of the most prolific indie game developers currently on the market. The creators, James Swirksy and Lisanne Pajot, take you on a journey through the lives of the designers and give you and inside look at the struggles trials and tribulations that game designers must overcome to succeed as independent entities in this industry. I personally can not wait till this movie comes out, and I want to see it in theaters. If it doesn’t make it to theaters, I think I will be deeply saddened, but that just gives me even more incentive to buy a collector’s edition of the DVD whenever it’s released. If I get an opportunity to see the movie I will undoubtedly be writing a review for it, but I personally think that any designer worth his [ or her ] giga-bytes should definitely take a look at this movie. If you’re serious about getting into game design, it’s a really good glimpse inside of a very challenging field. It doesn’t scare me really, but rather, the movie gives me hope and inspiration to continue working hard towards my goals. I know I want to be a designer for the video games industry, and the only way that I’m going to make it there is by having confidence in myself and practicing my abilities over and over until I end up with products like the fine gentlemen represented in the movie: Edmund McMillen and Tommy Refenes [ Super Meat Boy ]; Phil Fish [ Fez ]; and Jonathan Blow [ Braid ]. If you like any of these games, if you like games in general, if you have a desire to see how games are actually made, or you’re just hankering for some cool nerdy movie art – I suggest you check this out! Drive, Inspiration, Motivation, and Determination. Enjoy and I hope everyone gets a chance to go out and see the full movie!